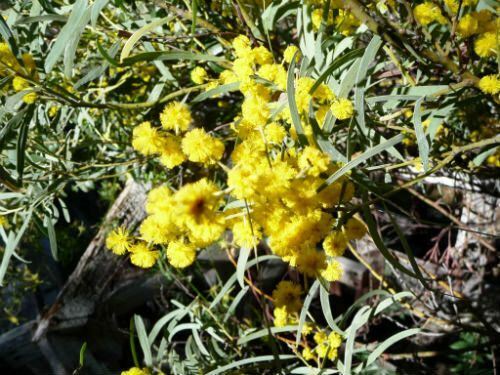 Acacia caesiella, Tablelands Wattle, is an erect or spreading shrub normally with multiple stems and reaching a height of 3.5 metres. The bark is smooth, grey or brown. Phyllodes are linear, up to ten centimetres long, seven millimetres wide, bluish grey and slightly curved with a small gland near the base. Flowers are held in globular clusters with 12-16 individual flowers in each cluster. They are deep yellow and cover plants in spring. A raceme of blooms is carried at the base of each phyllode. As the flowers fade cut off each branch behind the spent blooms. This will prevent plants becoming straggly, encourage bounteously blooming and prolong the life of the plants. Pods are straight to slightly curved, up to nine centimetres long and constricted between each seed. A. caesiella occurs mainly on the central tablelands and western slopes of NSW. The species is widespread in the Warrumbungle National Park, central NSW. The Tablelands Wattle is one of many “shrubby wattles” that could be used to create colourful hedges. The species name is derived from caesiellus meaning blue-grey and refers to the phyllode colour. Propagate from seed that should be treated with boiling water before sowing and possibly cuttings.